Recently, Gene Kim had a chance to speak with Mirco Hering about Mirco’s new book, DevOps for the Modern Enterprise. 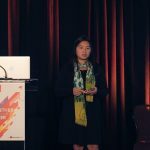 Gene Kim: What inspired you to write DevOps for the Modern Enterprise? Mirco Hering: To be honest, there are a number of DevOps books in the market and I was wondering whether I had something unique to say. 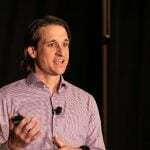 But then I realized that not a lot has been written of the complex organizational environments that people find themselves in with legacy applications and multiple vendors working along with people from their own organization. 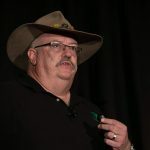 I wanted to address the challenge of a management mindset that was finely tuned for a different world where IT was considered to be predictable. I wanted to share what I have learned about those environments, and what I’ve learned from many failures and near-misses as well as my successes. My goal was to help with some simple activities that everyone can do in their own organization and to help the reader set themselves up for a successful transformation into a modern enterprise. I hope to be able to reach more people with this book than I would ever be able to personally work with, and help them on their journey to a better more positively exciting workplace. GK: You describe vividly the incredibly complex ecosystems that enterprises and their consulting/system-integrator partners operate in—what would you want everyone in both parties to know that would help them? MH: First that, in my experience, both sides genuinely want to find win/win scenarios and do the right thing. Engagements and relationships were created with the right intentions originally. Over time the environment and capabilities changed, but we did not keep up with the contracts and incentive models used. We still have the previous mindset and knowledge of what good contracts look like. 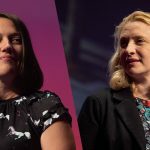 It takes courage to question those and change the rules of engagement for the DevOps and Agile way of working, but it is worth doing as both sides stand to win from it. Find people on the other side that have the same interest and start talking directly (and, ideally, face to face) and you will be able to shift the engagement over time one step at a time. The game of telephone that is sometimes introduced by having several intermediaries is distracting from the real goal. Find the right person in the other organization that has the same interest and initially find creative ways to make it work with sub-optimal contracts in place. You don’t have to throw existing contracts out and start from scratch. Make sure you are on the same page and find small creative increments of change. It’s amazing what can be done when people on both sides are on the same page and push in the same direction. GK: If your readers take away just one thing from your book, what do you hope that would be? MH: I hope they find at least one exercise that they will run in their organization, and learn something useful for their transformation from the book. 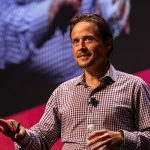 The one thought I want them to take away is that you don’t need complex frameworks to drive your transformation, but rather that you need the right mindset and principles to drive it, everything else is additional help that you can tailor to your needs. Implement a strong continuous improvement process based on the scientific method to drive your transformation. And remember that the mindset that made IT successful in the past is not the mindset that we need now and will need in the future. Okay, I guess that was two things, but I think they go hand-in-hand. GK: You state that “cultural change that is the hardest is also the most impactful.” For something that feels so abstract, what one concrete change can your readers implement today to help them down the path of a broader cultural change? MH: A truly open-minded and blameless continuous improvement process is a very good central change engine for cultural change. It should span across organizational boundaries. Once you are in a room where people from all across your organization and from your vendors collaborate to find ways to improve, you will know that the culture has shifted. I found that collaboration is easy when it is just one on one, but that culture manifests itself when larger groups come together. The before mentioned rigorous experimentation and evaluation process to assess progress at the core of continuous improvement takes the personal agendas off the table. This process can be aimed at all aspects of IT delivery, your overall business processes and your engagements with stakeholders. As soon as this process is somehow constrained or involves finding blame or excuses, it loses many of its benefits and negative culture will sneak back in. Once results improve through the right behaviours, your culture will start to shift too. You cannot change culture by itself, in my opinion; you have to achieve results with a new way of working which will in turn shift the culture. GK: What is the biggest challenge(s) facing legacy IT organizations today? MH: The biggest challenge for legacy IT organizations is that the complexity of their IT environments is shaping their worldview. They see it as a reason for why change is not possible. While it is true that it is harder, it is absolutely possible. The problem is that looking at “unicorns” and trying to emulate them is not going to make you successful. You cannot just use the “Spotify-model” or adopt the “Netflix-culture.” You have to do the hard yards of adapting your own organization in your ecosystem to the new world. The good news is that it is fun once you start understanding what success feels like, and I have seen many organizations starting to make that shift. GK: In your vision, what will the modern IT organization look like in ten years? What will be their biggest challenge(s) and their biggest strengths? MH: Looking 10 years in the future basically sets me up for an embarrassing follow-up interview, so let me make this follow up entertaining by pushing the boundary. The modern IT organization in 10 years will use a mix of technologies (cloud, on-premise, custom build and packaged) similar to many today, but has detangled them to evolve at the appropriate speeds independently from each other. Business stakeholders work in end-to-end teams that operate and change the systems which run the business and leverage commodity services from in-house and external providers for most of the non-differentiating aspects of their IT landscape. The challenge will have moved from a problem of scarcity (too slow, too expensive) to one of plenty (lots of change, fast moving). We will write blog posts about the need to not react to every data point or trend and to work on “out of the box” innovation that requires us to stay a course for a while even when data and customers suggest we need “faster horses” to develop the equivalent of “cars.” IT challenges will not be technology issues, they will be business challenges of identifying what is providing value and what is unnecessary and can be cut back. Data aggregation and synthesis will be at the core of IT as the remaining constraint and artificial intelligence is employed as a partner in our governance processes. 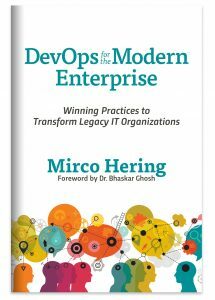 DevOps for the Modern Enterprise by Mirco Hering is now available for purchase at all major book retailers in print, ebook, and audiobook formats. There is a nice service – https://booksrun.com , where you can find , buy or sell any textbooks by it’s ISBN. They are providing free delivery for every client, so if you want to save some money, that’s the best choice!